Whether you want to dress your phone up for a party, or protect it on the construction site – or something in between – we have the accessories you need. A good case is a requirement for protecting your investment in a great phone. After all, we all drop things sometimes! We carry everything from the ultra-rugged Otterbox to the business-practical Skech book cases to the slim, elegant lines from UAG and Spigen – and more. Come in and browse through our selection for all types of phones! We carry the wonderfully effective liquid glass screen protector from TekYa. Liquid glass screen protectors are the only screen protectors that work on the curved edge-to-edge screens of today’s newest phones – and TekYa offers a one-year warranty against broken or scratched screens! For your flat-screen iPhone, we have tempered glass protectors in stock – and we’ll install it for you so you don’t have to fuss with aligning it just right and bubble-free. Have you seen the new wireless chargers? If your phone model supports it, they’re super convenient! And of course we also carry the usual plug-in (car or wall) chargers. We have both Bluetooth and corded, and even some for serious music-lovers: there are many styles and options. Come see what works for you! We stock both tried-and-true and up-and-coming brands! These are just some of the brands we carry. 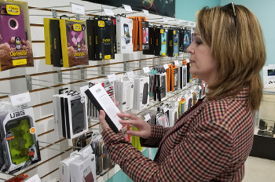 Come in and see what we have – we’re always on the lookout for new, fun, and practical accessories for your wireless phone! Spigen cases and screen protectors in stock!